Casa Fiesta is division of Bruce Foods and was a pioneer in the canned Mexican food goods industry. Casa Fiesta began production in El Paso, TX in 1931 and have been turning out economical, all natural Mexican inspired products ever since. 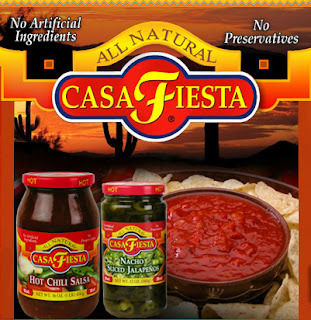 The Casa Fiesta brand has grown to include over 100 different products like beans, salsas, sauces, and taco shells. In need of a spicy snack, I cracked the seal on a jar of Casa Fiesta's Mild Chili Salsa. The chili salsa's ingredient list features only simple, natural ingredients. The salsa is a traditional tomato and vinegar base. It's heated with green chilis and jalapenos. The salsa was thick and chunky and clung well to the tortilla chips. The flavor was rich and tasty as well. The tomatos were well balanced by the onions and peppers. The heat level was pretty substantial for a mild salsa. I like my salsas hot, but those expecting a typical mild salsa may be a bit overwhelmed by the jalapeno spice. Katie and I both enjoyed Casa Fiesta's Mild Chili Salsa. You've got to respect a company that has been making qualty, all natural products here in the US for eighty years. Learn more about Casa Fiesta salsas and their entire product line by clicking on the title of this review. See how Casa Fiesta Mild Chili Salsa rates on the "Product Reviews" page. 0 Response to "Casa Fiesta Mild Chili Salsa"